Imagine Master Chef / Imagine Happy Cooking review part 2. Once you have completed a couple of cooking lessons, the game opens up a mini-map with several locations you can visit while walking your dog. Usually, your animated stuffed bunny, Hopper comes along for the trip too. Unfortunately, this walking section amounts to no more than some random encounters with people Lisa knows, followed by lots of text. At the end of it all, you're usually given a new item for your kitchen. Once Lisa receives the dolls house from her ever-absent father, you can customize the kitchen with the objects you find on your travels. Although you cannot add new kitchen appliances, you can change the colours and designs of many of the kitchen utensils and devices. No doubt the developers were told that little girls like this sort of thing, so it should be a welcome distraction for some players. As silly as the story is, little exchanges between Lisa and her toys make up a big part of the game. In fact for a game aimed at younger children there is a huge amount of text to wade through. It's here that the game is sort of at odds with itself. The simple cooking games might appeal to very young children, but pages and pages of text will not. Older children who can comfortably read through the story will be bored with the cooking games, which present no challenge. As you progress through the game there are also several mini-games to unlock. The obligatory pair-matching game is there, as is a washing up game and a very simple darts game. The mini-games are reasonably well presented but aren't particularly engaging. More fun is the free-style mode, which lets you choose which main course, dessert and side dish to cook. You can cook anything that you have already made in the main game as well as extra recipes Rachel gives you. 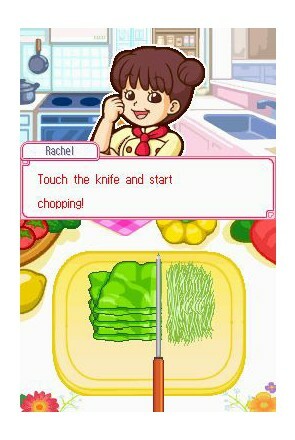 Overall, Imagine Happy Cooking / Imagine Master Chef isn't a terrible package, but ultimately it is up against some stiff competition on the DS, namely the rather splendid Cooking Mama and Cooking Mama 2. If your child found those games too hard, then she/he might prefer Imagine Happy Cooking / Imagine Master Chef, in spite of the rather long winded story scenes. For the rest of the young would be master chefs in the world, your pocket money is much better spent on either of the Cooking Mama titles.